Plan to send in your application by March 22 to take an exam for SBE certification at the NAB Show in Las Vegas in April. The exams will be held at the Las Vegas Hotel on Tuesday, April 9, 2013 from 9 a.m. to noon PT. Are you attending the 2013 NAB Show? Have you been putting off taking a certification exam? SBE will hold one exam session in Las Vegas during the NAB show on Tuesday, April 9th from 9AM to noon. Get your application into the national office by March 22nd, to take advantage of this opportunity. What certification is right for you? Check out this chart. SBE Certification exam sessions are also planned for June, August and November 2013. 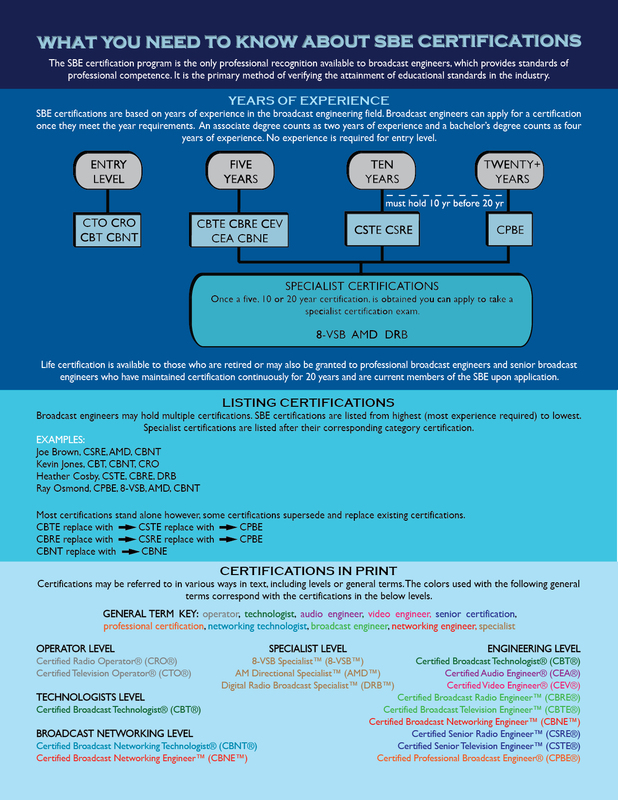 Here is a helpful chart for certification levels and how to list the certifications that you currently hold. The deadline for the June certification exam period is fast approaching. Submit your exam application by Monday, April 23. For questions about the application process or exam preparation visit the SBE website or contact SBE Certification Director Megan E. Clappe.